What happens to us is that when we get overwhelmed our brains keep trying to play catch up and in the process, this brain frenzy short circuits our actions. Now don’t get me wrong, we are working like crazy, but we don’t seem to be accomplishing much because we are trying to do too much too fast. We can even feel the CHAOS start to build. So why don’t we stop theavalanche before it comes sliding down on top of us! It is because we think if we just keep juggling we can keep all those balls in the air. We are not perfect and let’s face it; we are never going to be. But that is just fine with me. I don’t have to be perfect to be loved. My home does not have to be perfect to be lived in. Housework done incorrectly stillblesses my family. I can do anything for 15 minutes! What doesn’t matter, just doesn’t matter! When you feel the pressure start to mount then that is the time to let off some of the steam so you will not explode and the avalanche suffocate you! I can hear you now! HOW DO I DO THAT! Let me tell you what I do when I start to feel overwhelmed. I stop dead in my tracks when I first realize that I am beginning to feel antsy and SIT DOWN! Then I take a few deep breaths and get out a piece of paper. Automatically my heart rate slows down and that antsy feeling subsides.The reason it is hard for us to recognize that we are feeling overwhelmed is because we have been living on adrenaline most of our lives. We have to practice slowing down when we feel antsy instead of speeding up! Think of it this way. You are going to love this one. When you are driving and you see a problem way up ahead; do you drive faster to get there quicker. No you slow down and become more cautious. Imagine that all of a sudden you are driving in a fog and you can’t see where you are going. You have to slow down. Now you can’t just stop (crawl in bed) on the highway because there will be a major pile up (the house will fall apart). You have to proceed slowly and cautiously; being aware of everything going on around you. You even turn off the music so you can concentrate more. If you have a phone call you ignore it. Your mind has to be focused. That fog represents what is going on in our heads when we are trying to do too much at one time! We can do this with our driving! So let’s start practicing it with our race though our day. Your day doesn’t have to be one pile up afteranother! Slow your brain down by sitting down with a piece of paper. Put on some calming music and examine what is happening to you. Ask yourself these questions. Have I had any food today? Have I had any water? Am I dressed to shoes? What are the priorities? Write them down on your paper and put first things first. Set your timer for five minutes and take care of yourself so you canthink. Then use your timer to keep you focused. I call it a 15 minute day! It is kind of like crisis cleaning for your head. I take my list ofpriorities and start at the top and spend 15 minutes on that one. It doesn’t matter that it is not finished; then I set my timer again and goto the next item on the list. I do this three times then I sit for 15 minutes and collect my thoughts and rest at the same time. After timer goes off; I start again! Are you feeling overwhelmed right now? Try this! It doesn’t matter if you are at work or home? Your timer eliminates the fog in your head! Use it! Are you ready to FLY in a Fog-free area? 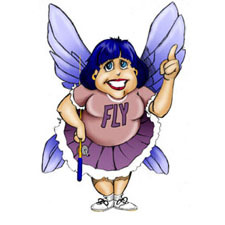 www.FlyLady.net or her book, Sink Reflections published by Random House, and her New York Times Best Selling book, Body Clutter, published by Simon and Schuster. Copyright 2011 Marla Cilley. Used by permission in this publication.